" Mellor Nook is unique"
"what a fantastic place to spend your retirment"
"the staff are willing to go the extra mile"
The quality of life which residents experience depends to a great extent on the calibre of the staff caring for them. Our trained and experienced staff team, which is well managed and adequately paid, provides high quality care in a responsive and understanding atmosphere. People living at Mellor Nook are often vulnerable, both physically and emotionally. Staff carry out personal and potentially embarrassing intimate services for residents and need special qualities to do this sensitively and tactfully. Such qualities include personal warmth, patience and responsiveness to and respect for the individual. They can provide competent and tactful care whilst supporting residents in maintaining and extending skills and self-care abilities. At Mellor Nook staff see themselves as a team which is consistent in its shared aims, with members fulfilling complementary roles. this ensures residents receive a satisfactory standard of care, The balance of staff can therefore match the residents' needs. · Ancillary staff (which includes the cook, building maintenance staff, gardeners). In addition, the role to be played by peripatetic staff such as occupational therapists and chiropodists is considered carefully. Current law requires that Mellor Nook runs with an adequate number of staff who have the right balance of skills and experience to meet the needs of residents. Each year Mellor Nook draws up a staffing schedule to show how the staff team meets the residents' requirements. The schedule is subject to inspection and approval by the inspection and registration authority Mellor Nook provides sufficient evidence that the right level of staffing with appropriate competence and training is provided. Mellor Nook never leaves the home in the control of a person with insufficient training and experience. The staffing establishment and rota system therefore are arranged so that there are enough senior staff and they are suitably deployed to give the cover required to meet the home's stated aims. The recruitment of good staff is critical to the running of Mellor Nook and is undertaken carefully. Staff at all levels demonstrate the right degree of knowledge, skills, experience and attitudes relevant to their jobs. Managerial and supervisory staff have qualifications as appropriate. · prospective employees must disclose all previous criminal convictions including those which are 'otherwise spent'. The Rehabilitation and Offenders Act 1974 (Exemptions) Order 1975 requires residential and nursing home care staff to disclose previous convictions. · proper records of the recruitment process are kept. It is sometimes difficult to balance equal opportunities procedures with the needs and rights of residents. The recruitment procedures and the composition of the staff team does as far as possible match the mix of cultural and language backgrounds of residents and local area. Job descriptions describe the roles and tasks which staff have to undertake. They outline the management structure and lines of accountability and the support and supervision available. They also set out the overall purpose of the job, linking the importance of the tasks described to the aims of the home as a whole. · instructions on receiving gifts or gratuities and not being involved in the drawing up of wills. New members of staff are given a job induction during which they are introduced to residents and other members of staff and the nature of their job described. The aims and objectives of the home and its routines and procedures (especially fire and safety) are set out for them, along with the standards of care which all members of staff are expected to achieve. This induction is inline with the standards laid down by "Skills for Care" and is completed by all care staff within six weeks of their start date. At Mellor Nook all staff to undergo a formal probationary period of three months to ensure that they are suitable for the job and the home. They are supported during this time with a review undertaken at the end of the period. In some cases this probationary period can be extended. Care is taken to ensure that new staff are not placed on duty together and unsupported. At Mellor Nook we place a new member of staff alongside a more experienced person who can act as mentor. Duty rotas are based on a working week of 26 hours. Staff are not expected to work additional hours regularly or to work more than five days continuously without taking a break. Rotas therefore pay attention to both shift patterns and time off duty. Care is taken to ensure that enough time and attention is given to handover procedures between shifts so that staff coming on duty are fully informed about any developments or changes in residents' circumstances. Detailed records of all information handed over are kept. Clothing worn by staff is suitable for the tasks that they have to carry out. There are arguments for and against uniforms. They tend to give an institutional feel to an establishment but the majority of our residents express a preference for staff to wear them so we consider them appropriate. We are careful not create a misleading impression that staff are nurses (they are not) or that staff are qualified (if they are not). Mellor Nook 's has a corporate colour and style of clothing. Name badges we find helpful, particularly if residents find it difficult to remember names. They are also helpful for visitors.. Jewellery such as brooches, chains and rings are either covered or not worn if it might scratch or harm residents. Attention is always given to matters of infection control, either from resident to resident, resident to staff or staff to resident, and so practical protective clothing is available for staff when needed. Care staff wear White tunics and Back trousers and Deputies wear Blue tunics and Black trousers. Mr & Mrs Critchlow and the Deputy Managers ensure that managerial structures, communications systems and staff supervision are sufficient to enable staff to undertake their duties effectively. Staff induction, manuals of guidance, inhouse training, staff meetings and individual supervision were considered carefully and laid out in detail. Mellor Nook takes on board that in the event of a crisis or an enquiry, management may have to demonstrate that the support structures which we had in place were sufficient. Mellor Nook staff are included in discussions about the running of the home. Staff meetings take place regularly and involve all staff. There is one-to-one supervision sessions for all staff on a regular basis although they may be required more frequently for care staff than other staff categories. The sessions enable managers to ensure that staff are performing satisfactorily and provide opportunities for constructive criticism and understanding support. Personal and career development is discussed. Working at Mellor Nook can be stressful. Staff learn to cope with death, serious illness and the difficult behaviour of some residents. For the home to be able to deal with such things as high levels of incontinence and aggressive and violent behaviour, we have policies and procedures in place which ensure enough support and training opportunities for staff and adequate staffing levels. 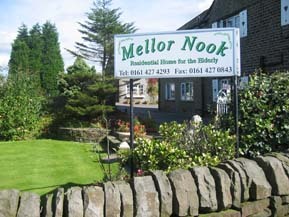 Mellor Nook has considered the residents' needs in relation to all types of staff in drawing up our staffing arrangements. We have set out the number of staff, their duties, salaries and the types of qualifications, experience and training which is expected for each post. We tend to employ part-time care assistants, which allows for more flexible deployment while our full-time posts tend to improve consistency and continuity of care At Mellor Nook staff carryout a wide variety of responsibilities, including resident care, cleaning, cooking and so on. In all cases, however, the duties required of staff are made clear at the time of appointment and any changes of duty or role, are recorded in writing. Mellor Nook's management and care staffing arrangements, consider two main factors. The first is the provision of minimum cover. There is a 'responsible person' designated on duty at all times during the twenty-four hour day. This means that there is someone present who can make decisions in an emergency, who is familiar with the home's procedures and practices and has the necessary skills and training to manage the service provided. Mellor Nook's cover is designed to cope with the general running of the home. But there are peaks and troughs in the residents' demand for staff support and help. Peaks include getting up, mealtimes, activities and going to bed; troughs include times when residents are out of the building and rest periods. Mellor Nook, therefore doesn’t only provide minimum cover but also deploys staff to offer additional support at peak periods. The employment of part-time staff enables such deployment to be flexible without causing problems such as split shifts for other staff. At Mellor Nook night staffing requirements depend upon the mobility and lucidity of residents on the one hand, and the type of handling problems anticipated on the other. 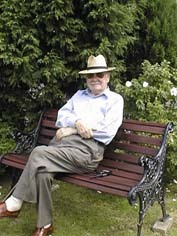 Where residents require moving, for example, two members of staff are needed Mr & Mrs Critchlow are on call every night. Ancillary staffing includes staff not primarily engaged to undertake managerial or care roles, but the value of their contact with residents or their therapeutic role is not underestimated. While only basic guidelines are offered for the numbers of such staff, Mellor Nook considers the tasks listed below. At Mellor Nook, care staff do the teatime cooking to help create a homely atmosphere, This approach was determined by the overall aim of the home, and appropriate training made available to ensure that residents obtain a varied, balanced diet that also reflects their individual wishes. This work is undertaken by outside contractors. In some circumstances, since good maintenance is important for the comfort of residents, especially when they are dependent on the efficient functioning of heating systems, hot water supplies, other household systems and aids with which the home is equipped. · a pool of staff is available for promotion and career progression. Mellor Nook also offers National Vocational Qualifications (NVQs) Five levels of qualifications are set out within the NVQ framework. At level 2 (which is the level most often worked towards by Mellor Nook staff), competence is expected in a variety of work activities, some complex and non-routine, along with the ability to work both alone and in collaboration with others in different situations. Mellor Nook staff find the combined support and direct care awards particularly relevant. Mellor Nook is committed to the training for all staff, particularly those who have direct contact with residents, training cannot be overemphasised. In particular, staff (both care staff and ancillary staff) benefit from training in guarding against abuse, promoting continence, and caring for those who are dying. In the case of residents who may show signs of developing dementia, it is important that those who have most contact with them understand their symptoms and know how best to handle those symptoms. This has a bearing on many aspects of residents' daily lives getting dressed, activities, mealtimes, going out, going to bed. We also provide training on health and safety issues, particularly, for example, in relation to food safety, manual handling and the use of hoists.